At least seven grenade attacks were reported Friday in Jaffna. 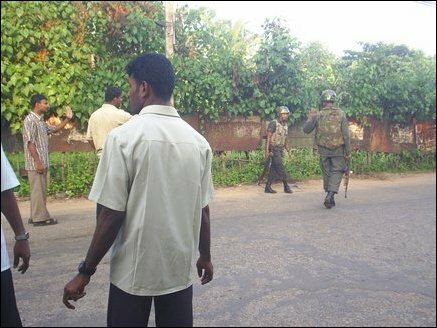 The attacks on Sri Lanka Army (SLA)positions escalated amid total shutdown in several SLA controlled areas of the Jaffna peninsula following the Neerveli kilings on Thursday. A handbill issued in the name of "Roaring People's Force" warned that reprisal attacks on SLA soldiers and intelligence operatives will escalate if attacks against Tamil activists and civilians continued. On Friday, at least five SLA soldiers were wounded in four different grenade attacks in three locations in Thenmaradchi. Two attacks were reported in Chavakacheri town close to the AGA office, one in Meesalai and another in Allarai close to Thambuthottam SLA base Friday night. In Valigamam, in Kuppilan, an SLA solder was wounded when unidentified assailants lobbed a grenade into an SLA position at Kuppilan Junction, 10 km north of Jaffna town around 7:00 p.m.
A grenade attack was also reported in Jaffna town, at Brown Road - Arasady Road junction, close to the Hindu Ladies College at 7:30 p.m. The grenade exploded outside an SLA checkpost wounding a civilian, Mr. Shanmuganathan Sivaneswaran, 35, from Erlalai, sources said. The wounded civilian was rushed to Jaffna hospital where five civilians hit by an EPDP paramilitary vehicle earlier on the day were being treated. In Vadamardchi, at 7.45 p.m. unidentified attackers lobbed a grenade at the office of the Eelam Peoples Democratic Party (EPDP) located in Manthikai. 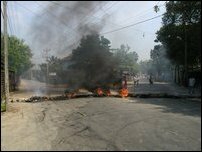 Tension prevailed in the area when Sri Lankan soldiers providing security to the paramilitary office returned fire. Two farmers who decorated the streets in Neerveli during the Heroes Remembrance Week were gunned down Thursday allegedly by the paramilitary cadres and intelligence operatives collaborating with the Sri Lanka Army. Another one was wounded. 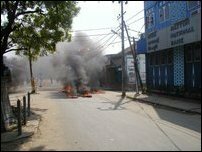 02.12.05 EPDP vehicle hits civilian auto-rickshaw in Jaffna, five wou..